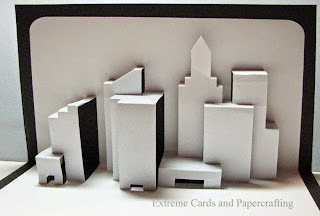 This is a wonderful New York skyline pop up greeting card by Popupology. 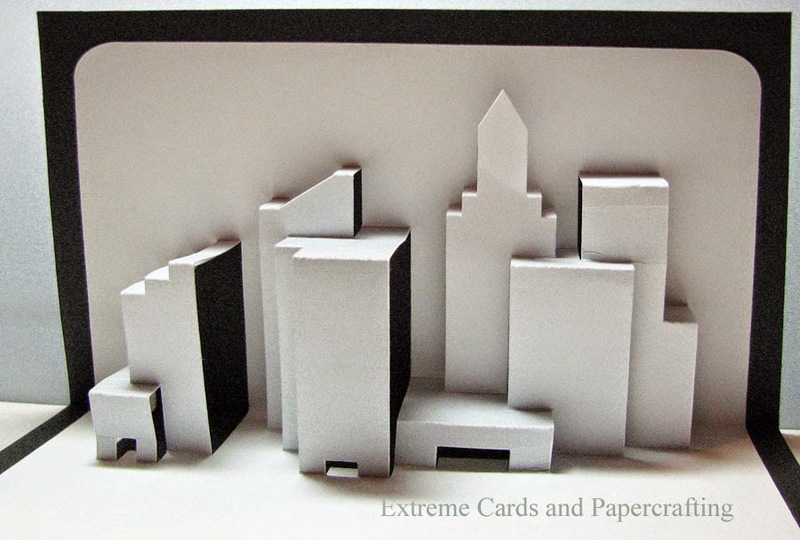 I opened their pdf in CorelDraw and added color to the buildings in several shades of grey. The grey gives the buildings more depth, I think, although you can't really see it in the photo. 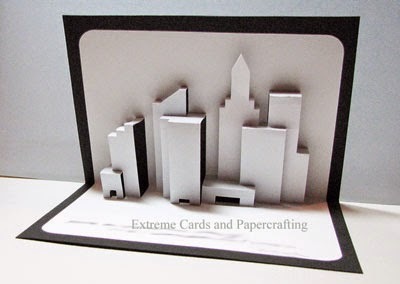 I printed the card, then cut and scored it with my Silhouette Cameo using registration marks. This design would be easy to hand cut, as well. A new (to me) trick that I used on the "Happy Birthday" on the front of the card was to apply a sheet of double stick adhesive to the glitter paper before cutting the letters. For this card I used a sheet that is labeled "3M 468MP 200MP Adhesive" which I got as a free sample from Lane Graphics, a producer of membrane switches, PCB switch assemblies, and graphic overlays. They will send you a grab bag of scraps of various adhesive types for $3.29, which is mostly to cover the cost of postage. Visit them on ebay for grab bags as well as larger quantities of adhesive. Cool stuff for crafters, and it keeps the scraps out of landfill! 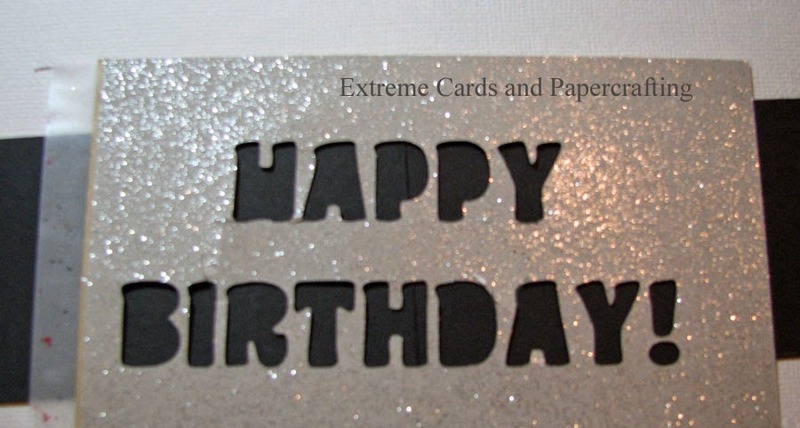 To cut the letters on my card, I peeled off one side of the backing on the adhesive and adhered it to the back side of my silver glitter card stock. I wanted to cut it glitter side down, but the glitter side would not adhere to my cutting mat, so I ended up taping it to the mat all around the edges. First time out I forgot to mirror the letters, but I got it on the second try. For Cameo users who are curious, I cut it with the knife set at depth 5, using the "magnet sheet" setting. After cutting, I popped all the letters out of the backing. 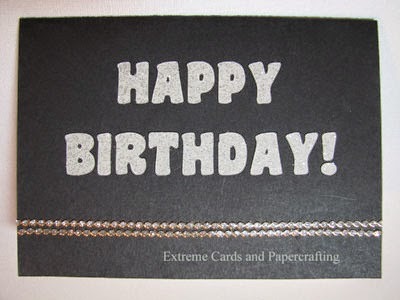 I laid the "negative" of the HAPPY BIRTHDAY cutout on my card and used it as a guide to place the letters perfectly. Position the card front under the cutout and tape both pieces down to your work surface with low tack tape. Peel the backing off the letters one at a time and place them in the cutouts. When you are done placing the letters carefully pull off the tape and the stencil.